Is there anything better than a warm shower, clean pajamas and climbing into bed with a good book? Not for me . . . let me tell you about this book I read. 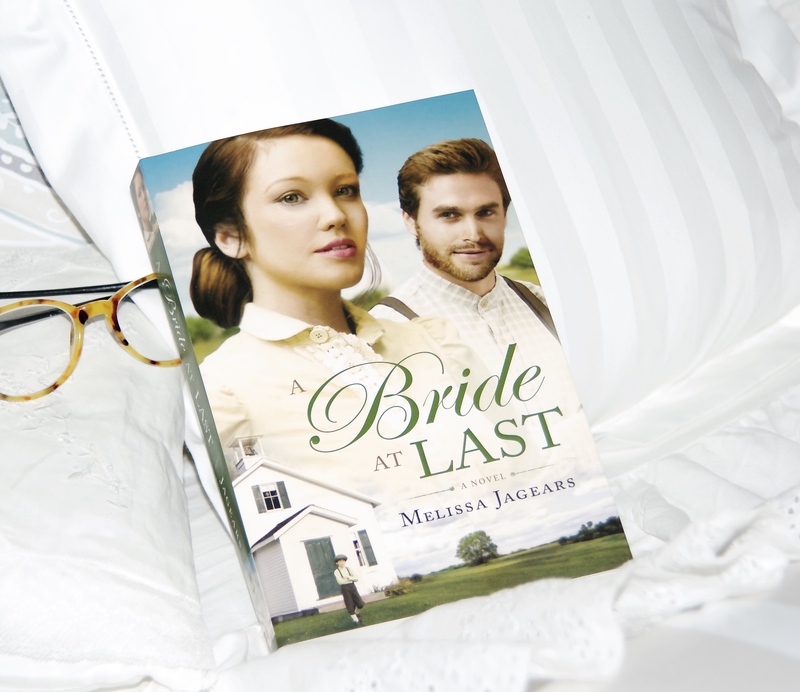 Recently I volunteered to join Melissa Jagears support team—I like her writing—a lot—and was happy for the opportunity to talk about her new book.‘A Bride At Last’. The first evening that I had a chance to read after receiving the book from Bethany House, I plunked it on my bed and hurried out to the kitchen to put the tea kettle on. Anticipation ran high. I was anxious to settle into bed with the new book and my hot jasmine tea. When I came back into my bedroom, first thing I noticed again was how pretty the book cover is. It sparkled against my white sheets. I often buy books because of a beautiful cover. I’ve been mislead a few times, but not many. And I wouldn’t have been mislead by this cover. The story is very entertaining and the author gives the reader a clear picture of her characters. Silas Jonesey is a man any woman could love. But he has problems as Kate Dawson discovers. Kate’s a strong woman with a good head on her shoulders ( not just a pretty face ). Not given to hasty decisions—she holds back. Watching, sizing him up. Silas and Kate both have weaknesses they battle. He’s made some bad choices in the past. And Kate, well, Kate just simply runs away . . .
Kate learns that running isn’t a choice anymore when she takes a young boy into her home after his mother dies. Her love for him leads her to make a big sacrifice, for his sake—oops, don’t want to spoil the story for anyone—you’ll have to read the book to find out what happens—you may be surprised. I thoroughly enjoyed reading A Bride At Last. I recommend it to other readers who enjoy the complexity of working out a relationship. Melissa Jagears writes about people with christian principles, who find christian solutions to everyday problems. Loved this book! Until next time, happy reading! And keep God first in your plans. This entry was posted in Latest Post and tagged Bethany House, Melissa Jagears, Silas Jonesey. Bookmark the permalink. ← Leaning on The Rail. Wow, this book sounds definitely a good read!!! Makes me want to run out to a book store and see if I can find it!!! Thanks for letting us know about this book! Hey, it is a good book, head to Amazon and grab a copy! You won’t be sorry! This review makes me want to get the book. It sounds like a great read! Dani, I wish I had created that image! The book was published by Bethany House. I assume they did the cover—it is beautiful! Sounds like a wonderful book that I must read. I need a good book to take up to eastern Ky where I go every two or three months to take care of Willie’s 97 year old aunt and her nephew. There’s not much to do there, so I always take along several books to read during the 10 days I’m there. You gave such a good review I can’t wait to get into it. I agree there’s nothing like a good book, hot shower, fresh pajamas and of course, a good cup of hot tea. Keep writing. Jenny, I remember you going up there to spend time with your husbands aunt—what a sweet thing to do!